Who are the "leaders" of the so-called "Regular Grand Lodge of (x)"? It is a now well-established principle amongst recognized Masonic lodges world-wide that each Grand Lodge has a type of 'sovereign territory' guarantee. No recognized Grand Lodge will create new lodges in the territorial jurisdiction of another. In areas where there is an absence of Masonic lodges, a Grand Lodge may decide that enough of its current members are already in that location and desirous of having Masonic communication there that they will constitute a lodge for them. A "regular" Masonic Grand Lodge simply does not 'set up shop' in another area where a Grand Lodge already exists. The Grand Lodge of Vermont, for example, has MANY members who spend the winters in the State of Florida to enjoy that climate as compared to the harsh winters in the northern part of the United States. However, the Grand Lodge of Vermont would never in their wildest dreams consider creating a lodge in Florida. Thus, it should come as no surprise that the so-called Regular Grand Lodge of England has set up what they call "Masonic High Councils" in - ostensibly - several of the United States along with what they term 'Regular Grand Lodges' as well. When breathless announcements were made and listing the leaders of the new groups, one particular item seemed very clear: these people were TOTALLY unknown within Masonic circles. Of course, it's an easy dismissal to say that one person can't know all of the names of all of the potential Masonic leaders in the United States. What folks making that dismissal fail to realize, however, is that the number of people who are VERY actively involved in Masonry isn't all that large, that jurisdictions always have inter-connections through the little-known officers titled "Grand Lodge Representative" and via visits to annual Grand Lodge events in surrounding (and often distant) states. Furthermore, those folks often give credit to others when recounting what's going on in their home jurisdiction and thus names tend to be bantered about, particularly in the Masonic educational venues where we're always reading essays from and stories about those who are leading, have led, or about to lead in Freemasonry. So one day while we were waiting for a computer program to do a VERY long task, we decided to see what we could find out about the many people listed by the self-styled 'Regular Grand Lodge of England' relating to their United States leadership. We started with internet searches that, again and again, failed to reveal ANY connection of a person with that name and Freemasonry even at the most basic level. We searched high and low on archived copies of lodge websites listing even their most junior officers along with stories about what their members were doing. Nothing! What surprised us too was that the first several names we searched didn't even seem to exist! While it's not impossible to not find an individual mentioned on Google or Yahoo, it's less rare day by day. We also noted that the names really didn't 'resonate' properly - something we had regularly noticed about the prose of Mr. Gabbiro on the RGLE website. It seemed so very odd that there was no way to contact the leaders of ANY of these bodies - except, of course, through more of those ubiquitous gmail accounts Rui uses. If we could make some phone calls, we thought we might get some additional information (much the same way as a person identifying himself as the Webmaster for the Grand Lodge of Greece with a UK accent and a UK phone number called us one evening.... We've got a recording of that and will likely add it here at some point just for giggles!). So we took the list of their officers and started to look up phone numbers. We decided on North Carolina as we'd lived there once upon a time and had enjoyed several lodge meetings and activities within that jurisdiction. We started with the "Senior Grand Officer" but - sadly - no telephone number was available through an internet search. On to the "Grand Chancellor", an office that no United States jurisdiction ever uses. Again, nothing. We tried the Secretary General but his phone wasn't listed either. Figuring that these top officers might be so important that they only had cell phones or something, we decided to check out a couple of "Council Members". There were LOTS of E. Jackson's listed but not a single one with the name of Erick. Finally success: there were two Conrad Taylor's listed. 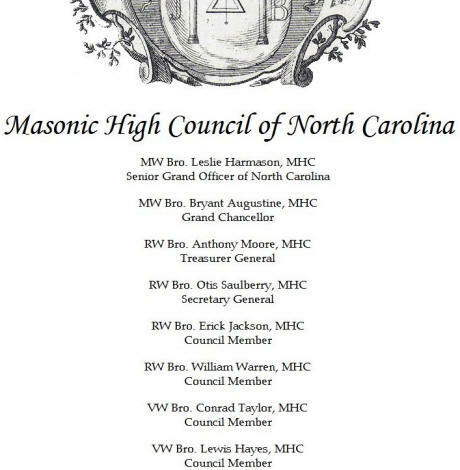 Would it come as a surprise to you at this point that neither had heard of the "Masonic High Council of North Carolina" or anything like it? Could it be that essentially every single one of the officers of this North Carolina branch of the so-called Regular Grand Lodge of England have no installed telephone at their residence? Heck, nearly all Grand Lodges provide names, addresses and phone numbers of their most senior officers. They've got nothing to hide. What about the RGLE? Maybe it's different there. Not to be deterred, we headed to the Illinois list. Their REAL Grand Lodge has featured this site as a reference point and they've got a couple of GREAT guys there who understand and appreciate the foolishness of anti-Masonry. 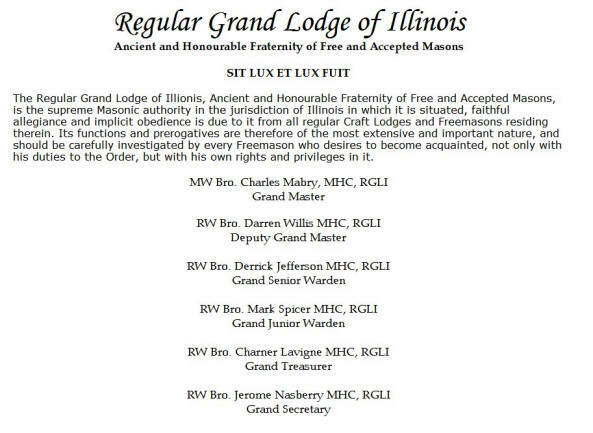 If we could find the identified leaders of the so-called "Regular Grand Lodge of Illinois" to talk with them about their organization, we could confirm through our associates what was really going on. And besides, they themselves write that associations should be "carefully investigated", right? Let's start at the top - with the Grand Master! Nope, no listing. The Deputy Grand Master? <SIGH> Nope, no phone listed. There were several "D. Willis" but not a single Darren. A number of Mark Spicer listings, an apparently common name in Illinois unlike the others. There were four D. Jefferson listings but, sadly, not a single Derrick. Needless to say, there was no Charner Lavigne or Jerome Nasberry listings. WOW! These folks must REALLY want to keep this group a secret and it looks like they've all eschewed installed phones with listed phone numbers. Why??? We stopped with these two groups but based on the peculiarities of names, we suspect that if we were to work our way through every single one, we'd find exactly the same results. Now we're not so gullible as to think that this is all just a mistake: that the webmaster (Rui!) just made errors in spelling or that these folks live outside the state perhaps. You, dear reader, are free to reach your own conclusions based on a preponderance of evidence. Needless to say, this is not unlike usenet newsgroups where those wishing to promote their self-created groups establish a fantasy surrounding them, apparently being so totally self-centered as to think they'll never get caught. In July, 2006 we received an e-mail from Joseph C. Burris signed as "Masonic High Council of the USA Confederation of Regular Grand Lodge". He proceeded to state that each of the so-called "Regular Grand Lodges" was formed by three "regularly chartered lodges". Of course, that's not true as there are a couple of these groups with internet websites that only identify ONE lodge under their aegis. Still further, he forgot to mention that the "Regular Grand Lodge" had chartered these subordinate lodges for the purpose of forming the so-called "Grand Lodge". Turning in circles yet? It gets MUCH better! He also noted that they were all chartered by their respective states. Whoops! 'That dog don't hunt.' as the expression goes. We've already addressed that foolishness. See this page. Mr. Burris went on to state that they have members who were "...once main stream and Prince Hall masons that joined the Regular Grand Lodges in North America under the auspices of the Regular Grand Lodge of England, on their own free will and accord, due to the bigotry and racism that is associated with the so called main stream Grand Lodges." Ah, the 'race card'. Mr. Burris likes to use this a LOT as we'll soon see. He then made a most amazing statement: "Freemasonry is a democracy..." REALLY? Just as in even his own little group, I suspect, the Master has effectively unlimited control to rule and govern his lodge. He does not follow any type of 'Rules of Order', can open or close discussion at his pleasure, and can close a meeting even if there are those who still want to have a say about something. Is this his idea of a democracy? And does he think that if he and his friends on the so-called "Masonic High Council" were to challenge Rui's authority and power, they'd hold their 'high' office any longer? It is really funny to think about. "Many of our members were healed (re-initiated, passed and raised) by European regular Freemasons. With that being said we are regular and legitimate and have amity with many Grand Lodges." They were "RE-INITIATED"? So they were bogus in the first place, and have now gone through the degrees a second time (paying more money, no doubt) so they can continue to be bogus. How sad. Mr. Burris should have added that they are in amity with "many Grand Lodges...of our own making!" because while he can claim legitimacy unto the ends of the earth, regular/recognized Masonic lodges and Grand Lodges throughout the world will never, ever agree with his claim. And further, their own website says that Mr. Burris and friends were "regularized" in November, 2006. So comical. Oh, and should we quietly mention that despite the word "regular" in the name of the French group, they're not either? You probably figured that out already. In October, 2006 we received a short note from Mr. Burris asking that we remove his quoted comments. In May, 2007, we received yet another, similar note to which we replied asking why a "Grand Master" wouldn't want the world to know all about their organization. He stated - amazingly - that his military clearance could be affected even though at that time we identified him only by his surname. In subsequent e-mails, he stated that because he had used a military computer for his correspondence, he was going to be in trouble with his command and THEY were demanding that the material be removed because it had been sent from...a military computer. Yeah, right! While use of a military computer for private business on military time could easily be a violation of command rules, the military doesn't expect recipients to pretend that they never received the communication! Further, such acts don't rise to the level where a security clearance could be jeopardized unless this shows a pattern of repeated abuse. We immediately wrote back with offers to contact his command as well as our congressional delegation. Not unsurprisingly, and realizing he was caught in his self-created web of deceit, he admitted that he had used that 'story' as a ruse. Then, when we replied that it really was pitiful he'd been using the current US support of military personnel as a ruse for his lying, he proceeded to excoriate us as being the liar - and, predictably, again used the 'race card'. It's pretty sad that these folks are SO desperate that they must behave in this manner, all the while claiming to uphold the tenets of Freemasonry. You can read more about Mr. Burris' Grand Mastership right here. And we'll be happy to post any reply he now wishes to make about this sordid affair. In December, 2009, we learn that Sergeant First Class Lesley G. Harmanson, the ostensible "Senior Grand Officer for the Masonic High Council" is serving in Iraq where he is 'passing out degrees'. Those who are Masons or those who want to be should steer clear of this since affiliation (even attending meetings of) a bogus Masonic organization such as theirs could be a cause for expulsion (in the case of regular Masons) and non-admittance (in the case of those who are not now members). Take due notice thereof and govern yourselves accordingly! In August, 2006 we wrote: "We also wonder how the folks in the US who've bought into the Masonic High Council stuff feel about Rui 'instituting' his Sovereign Sanctuary in the US to compete with their various appendant bodies. Maybe they won't care if they pay him more money and get a fancier title....???" Aw, that was TOO easy. Mr. Burris is now Most Illustrious Knight Joseph Burris, Sovereign Grand Conservator General of the Sovereign Sanctuary of the USA - 94th Degree - which their 'press release' (here in a PDF format describing the February, 2007 event) states "At last the ceremonies, traditions and rituals used in the Sovereign Sanctuary of our Most Illustrious Brother John Yarker in England 1870, the Ancient and Primitive Rite is restored within the United States of America." Why they've even got their own website here so they MUST exist, right? Perhaps they won't want us to mention that Coil's Masonic Encyclopedia refers to Yarker as a charlatan. My friend and Brother Trevor McKeown is more generous. And then there's that other group claiming that THEY are the 'real deal' and they've been on the internet far longer. And then there is that inconvenient little history involving these degrees which were sold through a scheme of mail fraud and degree-peddling that culminated with a conviction in Federal Court at Salt Lake City, Utah on May 15, 1922 against Matthew McBlain Thompson, Thomas Perrot and Dominic Bergera. Those interested in the history of M&M are encouraged to consult "The Thompson Masonic Fraud" by Isaac Blair Evans, Abbott Press, 1922. Evans was the prosecutor in the case. Take due notice thereof, Mr. Burris and associates, and govern yourselves accordingly. Where did this all come from? Well, the long-dead Ancient & Primitive Rite of Memphis has been touted for quite some time by - you'll never guess - none other than Rui Gabirro! Updated 14 September 2006 and 15 May 2007 and again in December, 2009.